The Whispering Grove refers to the place where wind in the trees makes the special sound "Phan-tom, Phan-tom". 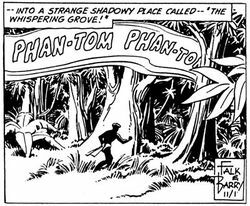 According to the few maps of Phantom Country, the Whispering Grove is to the east of the Deep Woods, towards Phantom Head Peak. The trees are impossible to cut down like normal trees, chain saws and axes will break. To the Oogaan tribe, who lives nearby, the trees are sacred and not allowed to cut down. They only take trees who have fallen over by the wind. Oogaan are the only ones who know how to work the golden wood of the trees: it can only be done by first putting juice from the golden berries (also growing in the Grove) onto the wood.